Vegg is a 100% Plant-Based Egg Replacement that to me smells like eggs, looks like whipped up eggs and tastes very similar to eggs, in fact to me taste better then eggs. I am not a fan of just eating an egg, they kind of gross me out but I do eat the from time to time and of course use them in baking and some meals I make. With Vegg you can now get the same egg taste and texture in a plant-based replacement. 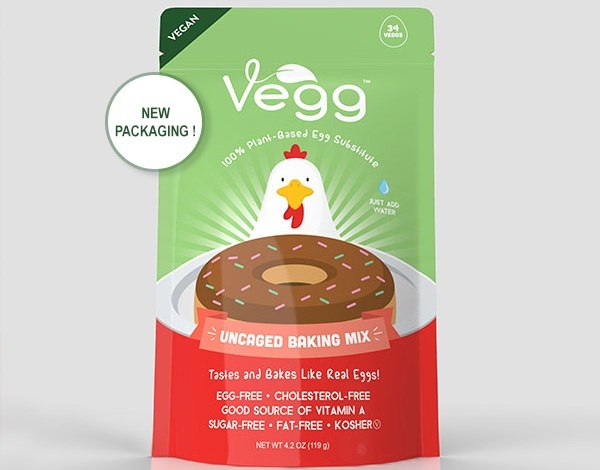 The Vegg produces and distributes the world’s healthiest 100% plant based-egg substitutes. Our products are all 100% vegan, plant-based, cholesterol free, gluten free and Kosher. Created in 2012 by Rocky Shepheard in Stroudsburg, Pennsylvania, the company is now under new management and headquartered in Carle Place, New York. We pleased to serve a broad range of customers within the United States and around the world. Power Scramble is the first Vegg product I tried. It’s crazy how close to an actual scrambled egg it tasted. I cooked it in a frying pan with some olive oil, salt and pepper. It’s the perfect egg-free, cholesterol-free, low-fat, sugar-free egg replacement and it’s even high in vitamin B-12, a good source of iron and Kosher. So no matter what your reasoning is to not eat eggs, this is a perfect fit for you. Take your Vegg Power Scramble, I think it was 3 Tablespoons to 1/2 cup of water, whip it up, add a pinch of salt and pepper and pour it into your skillet with warm olive oil, or you can cook in the microwave. When mixing it up it will smell just like eggs. When my power scramble was done I tasted it, ate about half and my phone rang, after my long phone call with my mom I went to eat the remaining and didn’t like them as much. I felt like they taste much better warm/hot. Either way, still delicious. Vegan Egg Yolk was the second Vegg product I tried, once again it really did taste like a runny egg yolk. I also used this in a recipe that called for egg yolks. I mixed it up like as if I was making and egg then added it into my sauce and it turned out great. Makes making hollandaise sauce easy. Once again egg-free, cholesterol-free, calorie-free, sugar-free, fat-free and Kosher. You can use this in all your baking that calls for eggs. Just mix it up according the the directions on the back of the package, uncaged baking mix, sugar and water = one egg. Great for cakes, cookies, bread and so much more. I used this just about every day. All my recipes turned out perfect, just like as if I added an actual egg. I also go this The Vegg Cookbook, it’s packed full of 80 pages of recipes all using Vegg 100% plant-based egg substitutes. All are 100% vegan recipes. I was very impressed with all the Vegg products. I will continue to purchase them when i’m out and use them for when I want eggs, when I need an egg replacement and any other egg necessary use. The taste & texture are so close to a real egg it’s amazing. Check out Vegg and order some of their amazing products today!